My favorite way to cook pork tenderloin is pan frying pork medallions. It only takes a minute and the meat turns out juicy and delicious every single time. 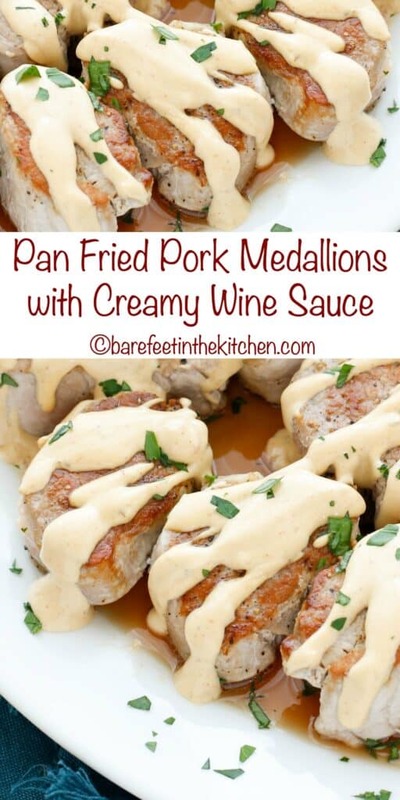 This recipe for Pan Fried Pork Medallions with Creamy Wine Sauce has become a reader favorite from my first cookbook, The Weeknight Dinner Cookbook. Side note: If you haven’t yet grabbed your copy of that cookbook, get it now! It’s on sale for under $15 and the reviews are consistently awesome. I am so glad that you all are enjoying it! 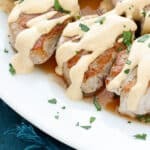 Back to this recipe though, I’m thrilled to finally be sharing my tips for how to cook pork tenderloin with you today. 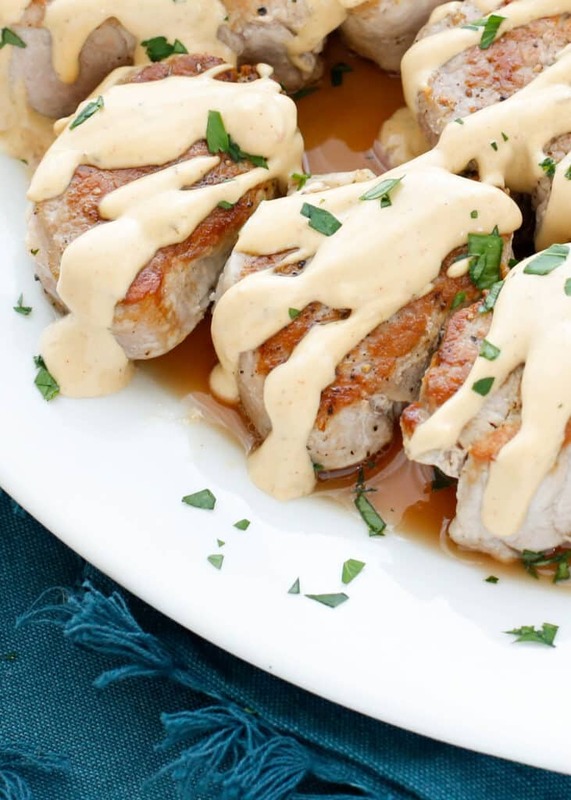 This post is written in partnership with The National Pork Board and I could not think of a better recipe to celebrate the awesomeness that is perfectly cooked pork. 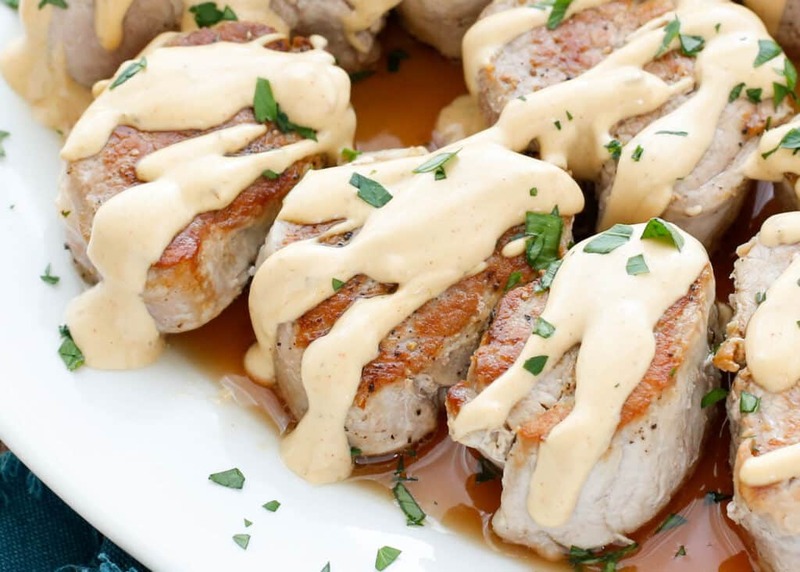 My all-time favorite way to cook pork tenderloin is by slicing it into pork medallions. The greatness of this method is seen in both how quickly the pork cooks and how juicy the results are. To create the medallions, a tenderloin is sliced into 1-inch thick pieces. To the best of my knowledge, you can’t buy the meat sliced this way in the store, but fortunately, it only takes about two minutes at home to create perfect pork medallions. Once you’ve sliced the tenderloin, you’ll pan fry the pork for just a few minutes. Use the drippings in the skillet to make a creamy pan sauce, and you’re done. Roast some broccoli or asparagus while cooking the pork, or boil baby potatoes, and you’ll have dinner on the table in under 20 minutes. I tend to use Pinot Grigio or Chardonnay for most cooking. If you aren’t a big wine drinker, the small bottles that are sold in a 4 pack in most grocery stores are a great way to keep wine on hand for cooking without opening a full bottle for a recipe. If you’d prefer not to cook with wine at all, chicken broth may be substituted for the wine in most recipes. The flavor will be different, but the recipe should work the same way. In this particular case, it works well and the sauce is delicious when made with chicken broth. Slice the pork tenderloin into 1-inch medallions and lightly sprinkle each side with salt and pepper. Warm a large stainless skillet over medium-high heat. Add the oil and when it is shimmering, add the pork to the skillet. Let the pork cook without touching it for 3 minutes. Set a plate next to the stove along with a piece of foil to cover the pork. Use a metal spatula to get underneath each one and flip them over. Don’t worry if they stick a bit. Cover with a lid and cook for 3 minutes. Lift each medallion with the spatula and transfer to the waiting plate. Cover lightly with foil to keep warm. Place the empty skillet back on the stove over medium heat. Add the wine to the hot skillet and use a spatula to scrape up the little browned bits of meat and deglaze the pan. Add the chicken base, whisk to combine, and cook for about 2 minutes. In a small cup, whisk the cornstarch, and paprika into the cream until smooth. Add the cream into the saucepan slowly, whisking until combined. Continue cooking over medium heat, stirring constantly until it thickens slightly, about 1 minute. Pour the sauce over the pork, sprinkle with parsley, and serve. In a small cup, whisk the cornstarch, and paprika into the cream until smooth. Add the cream into the saucepan slowly, whisking until combined. Continue cooking over medium heat, stirring constantly until it thickens slightly, about 1 minute. Pour the sauce over the pork, sprinkle with parsley, and serve. Enjoy! COOK’S NOTE: I tend to use Pinot Grigio or Chardonnay for most cooking. If you aren’t a big wine drinker, the small bottles that are sold in a 4 pack in most grocery stores are a great way to keep wine on hand for cooking without opening a full bottle for a recipe. If you have any questions or would like to learn more about pig farming in general, you can find more information at Pork.org. Disclosure: I’ve partnered with National Pork Board to share this information with you. As always, all thoughts and opinions are my own. « Recommended Pork Cooking Temperatures & An Oven Thermometer Giveaway! Sounds delicious! I wonder what adding mushrooms to this dish would taste like. This recipe is amazingly good!! The cream wine is has a delicate yet gourmet flavour that is really quite simple to make. This recipe would be fabulous for entertaining special friends for dinner! My husband said this was the best thing I ever made. This was really good. I fried bacon lardons first and used the grease instead of oil to fry the pork in but followed the rest of the recipe exactly. I served the bacon with the pork drizzled in sauce. My husband and my picky 4 year old devoured it. Wowzers! The sauce was simple yet sophisticated. Medallions were juicy and tender. When my love shakes his head yes, every time he takes a bite, I know I'm #winning! That's awesome, Christine! I am thrilled that you both enjoyed the recipe so much. Thanks for taking the time to tell me!